Trees enhance the value and aesthetics of your yard. They can provide shade, protect you from wind, and even offer food in the form of fruit. They attract birds and animals, and protect the environment. For all that, they can be easily damaged by well-meaning homeowners. A broad range of things can cause serious damage to your tree that might take years to heal, or might actually kill the tree completely. 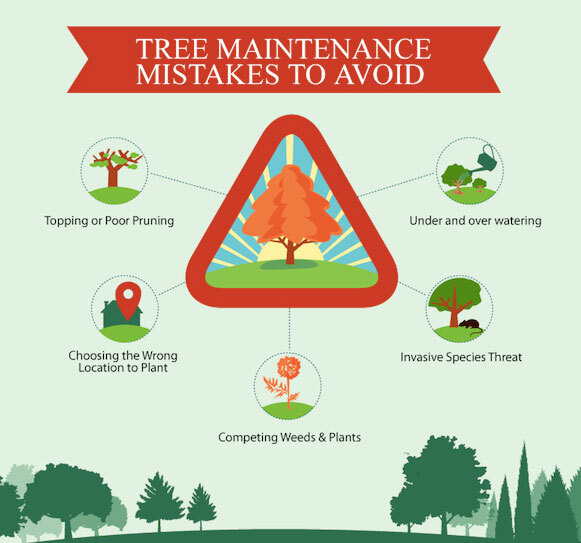 It’s vital that you avoid the following top tree mistakes. We use a wide range of mechanical devices in our daily lives. Whether you’re getting a bit of exercise by pedaling down the road, or you’re trying to tame the jungle that your yard has become, there’s some sort of mechanical device involved. Mechanical damage to trees can be very serious. Weed trimmers and lawnmowers are the most common culprits here, but even a bike leaned against the trunk can be problematic. Trimming or cutting around the base of a tree can easily lead to cuts, gashes, scrapes and other injuries that puncture the tree’s bark and living tissue to the wood beneath. These wounds often don’t heal, or heal improperly, allowing diseases and pests to invade the tree. Even in the best-case scenario, a healed wound limits the tree’s ability to transport water and nutrients from the roots to the crown, reducing growth. Pruning is an important maintenance act, when done correctly. When done incorrectly, it’s a terrible mistake. Removing too much or too little of a damaged limb, or removing live, healthy limbs can cause serious issues down the road. If you prune a limb too close to the trunk, you risk creating a serious injury. If you leave the nub too long, it will rot, allowing diseases and pests to thrive. You can avoid topping your trees by planting the right species in the first place. Know the maximum growth height of the tree before you plant it. Choose the location carefully, so that there are no obstructions when the tree reaches maturity. Like all other plants, trees need water to survive. They don’t wilt like your vegetables under a hot summer sun, but they do suffer without water. Moreover, a lack of water will cause a host of problems, including eventual death. Too little water retards growth and creates immediate health problems, but even eventually catching up on watering might not be enough to ensure it lives. If you are unsure that you’ll be able to provide for a tree’s water needs, choose a species that can survive in the Mid-Atlantic region that needs little water. Sure, that ivy might look beautiful growing up the trunk of your white oak, but do you know the threat it poses to the tree? We tend to think of trees as impervious to harm from other plants, but that’s not the case. A wide range of plants, weeds and invasive species can cause problems. They fight for nutrients and moisture from the soil, and they can also make it easier for insects to colonize the tree, eventually killing it completely. Avoiding these top tree mistakes will help ensure that your trees grow strong and healthy, providing beauty and shelter for decades to come.